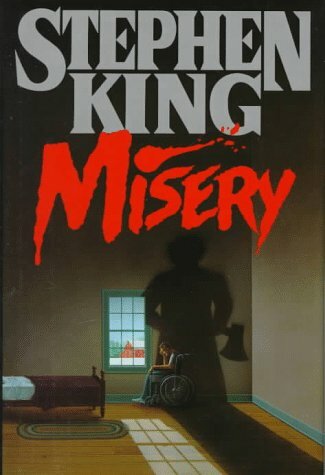 I found this ’80s Viking edition of Misery a few years ago, in my boyfriend’s garage. His parents were re-organizing the basement and getting rid of anything unnecessary–including old books they would never read again–or read at all. His mom wanted to give Misery away because she prefers literary books, “complex” books. Popular novels just don’t cut it for her. That’s usually the case with me too. But I was still not sure how to feel about Stephen King, and whether I could count on his books to be literary. Then I remembered it was his memoir, On Writing that originally got me serious about writing when I was 16. And from that, I had developed a theory that he writes popular horror and thriller novels to make a statement about the current reader market, and to get back at his creative writing professors in college who told him he needed to write political prose and put away the science fiction and fantasy. Simon and Schuster is King’s primary publisher, so I thought it would make sense for me to read another book of his–and also because it is October and I’ve been waiting years to be out of school and have the opportunity to read whatever scary books I want to around Halloween. Through Misery, I found that, just as I’d theorized, King appreciates the difference between popular novels and literary novels. The protagonist, Paul Sheldon, has won his fortune by writing a sappy romance series. Though popular and rich, Paul wants to regain some of his integrity as a writer. He abandons the realm of romance by killing off his famous protagonist of the series, Misery Chastain (although the death was not on purpose–it just happened while he was writing). This infuriates his devoted Misery fans, including Annie Wilkes, a psychotic and manic depressive recluse whose happiness has hinged on waiting for every Misery installment since the series began. One minute, Paul is driving across the country, working on his “real” novel–the one that should win him prizes and honorable mention. The next, he is waking up with both of his legs broken after a car accident Annie magically saved him from. She is nursing him to health, but only with her own delusional interests in mind. This novel is a writer’s novel. It teems with meditations on the craft of writing–mediations King later expands on in On Writing. It is about the interaction between writers and their fans, and the struggle to write what feels right while also pleasing readers. Annie might be an extreme specimen, but she doesn’t want anything outrageously different from Paul’s other fans. She just knows she is crazy enough to cause harm to Paul if she doesn’t get her way. King paces this novel well. Half way through, Paul seems to forget what Annie can do to him–and in turn, I forgot what King can do to his readers. For some reason, I thought the worst Annie would do was keep Paul confined to a room and force him to write a Misery novel just for her. I should have remembered King has the creativity and the courage to go much further, and that’s what we love him for. This may be snooty, but sometimes the way King uses metaphors annoys me. He will create a pretty good metaphor–like comparing Annie to a goddess who has the power to determine the outcome of Paul’s life. But then he just keeps hammering the metaphor into the text, to the point where it doesn’t dazzle me anymore, and it becomes over-writing. Or maybe that was Paul’s doing–the story is in first person, after all. However, the over-repeating of metaphors, I think, happens in the other few works I’ve read by King. Another one of his stylistic choices that bothers me is when he has his characters use little strange words or sayings. This is not to say that characters can’t have their quirks, but, again, these strange little sayings do get hammered too. In Misery, though, this was appropriate. Annie’s use of phrases like, “dirty bird” and “cockadoodie” did not bother me because her condition allows for it. And her use of these sayings were damn funny because she is also so sinister. This novel broadened my vision of King’s writing, and confirmed my theory I stated earlier. King knows complexity, and knows how to be literary, but he also knows what sells. And I think after years of his success, he knows how to weave both the literary and the popular into exciting and original novels. Previous postDo Writers Actually Live? I think you are right about King. Re-reading The Shining, I think that the true horror isn’t what the hotel hides, but the possibility of what Jack hides. As supernatural as his stories are, the human factor (the teenagers of Carrie who push the protagonist over the edge, the alcoholism and abuse of Jack, the small town politics of Salem’s Lot: the big three of King’s horror) seems to trump the vampires and werewolves and the like. Sure, King tells a good horror tale, but there are always human characters in his books. The funny thing about King and his status in the literary community (all of which think true literature is whatever they believe is literature, literary merit is based off the blurbs from famous authors and whatever awards a book may win) is that he is among the most prolific of our time. Plus, he has one of the best writing guide books out there. So in the forty or so books he’s written, he is bound to have a few bad ones. Actually, a good amount of bad ones. But Jesus, his good novels should be considered classics of our literary community. Thanks, Nick! I know our conversations always come back to Stephen King lol, but you are right, ON WRITING is one of the best! And it really is amazing how prolific he is. Thanks for responding! I really need to read some Stephen King. This may be shocking but I’ve actually never read him before? Nick and Steph, where do you recommend I start? Okay, here it comes: I LOVE King’s nonfiction. So I would actually recommend starting with ON WRITING because it’s great personal writing. But if you are in the novel-reading mood…I’ve only read a few by him myself. If you want horror, I would say start with CARRIE (his first published novel) or actually, MISERY. I’ve never read THE SHINING, but I’ve heard it’s awesome. If you want something less horror, more suspense-ish, I’d say read DIFFERENT SEASONS, which is King’s collection of 4 novellas (including the story that the film, THE SHAWSHANK REDEMPTION, was based on). The collection’s called DIFFERENT SEASONS specifically because it’s totally different from the horror stories he usually writes.